Former Fed Chairman Paul Volcker is pushing for a change that would put at least one top regulator out of business. Five years after giving his name to a rule designed to restrict trading by Wall Street banks, Paul Volcker is pushing for another change that would put at least one top regulator out of business. The Federal Reserve would be at the helm of a reorganized regulatory system that eliminates the Office of the Comptroller of the Currency and combines other agencies in a plan released Monday by the Volcker Alliance, a group formed by the former central bank chairman in 2013. “The aim is a simpler, clearer, more adaptive and more resilient regime that would have a mandate to deal with the financial system as it exists now,” the group said in a report outlining its call for a new Prudential Supervisory Authority to handle supervision currently done by the Fed, OCC, Federal Deposit Insurance Corp. and the market regulators. 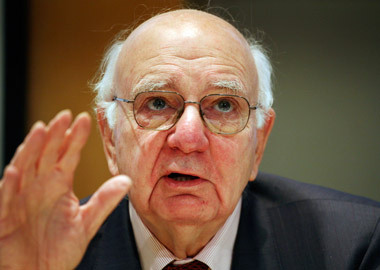 Support from Volcker, who ran the Fed from 1979 to 1987, was crucial in winning enactment of the Dodd-Frank Act trading restrictions that bear his name. The goal of the changes now being sought by his group of former lawmakers and regulators is to address the unfinished work from Washington’s response to the 2008 credit crisis. Concerned about a regulatory and supervisory framework that he’s called “rickety,” Volcker told reporters Monday that the system “just doesn’t make sense” in today’s world. Lawmakers missed an opportunity in Dodd-Frank, he said, and now they should make amends. In arguing for changes to a system where oversight is both inconsistent and overlapping, he made a pitch for his former agency as the ideal place to house the new regime. “The Federal Reserve is the best-equipped, the most independent and most respected financial agency of the United States government,” he said. That endorsement comes at a time when the Fed is facing criticism that its examiners are too cozy with Wall Street and insiders such as former Dallas Fed President Richard Fisher are calling for an overhaul of how its governed. Volcker said he’s pitched his ideas to members of the Senate Banking Committee who are weighing changes to the central bank agency. The plan would throw out the OCC, which oversees national banks, and the Securities and Exchange Commission and Commodity Futures Trading Commission would be united as a single agency writing rules for the capital markets. The FDIC would keep its job managing the insurance that protects people’s bank deposits and its authority to liquidate failing firms. As for community banks, they’d get their own division under the Prudential Supervisory Authority.